Journey MP3 Player Will Rock Your World | OhGizmo! I’ll admit that I’ll listen to Journey every now and then. I only own a few of their songs and probably wouldn’t go as far as to call myself a fan. I definitely wouldn’t go out and buy an MP3 player that’s dedicated to the classic rock band. 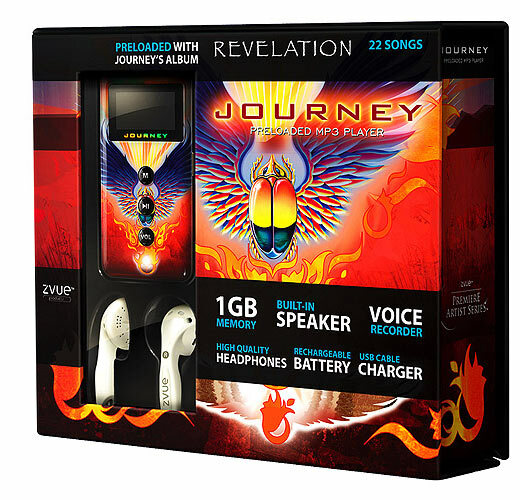 This strange MP3 player features the band’s unmistakable scarab logo, and comes pre-loaded with the entire Revelation album. For those not in the know, half of the tracks are brand new, while the other half have been re-recorded with a new lead singer. You aren’t going to store much on here, as it only holds a whopping 1GB of music. At least it isn’t terribly expensive at $40.